For artists, galleries, collectors and everyone else – WrkLst works for you. 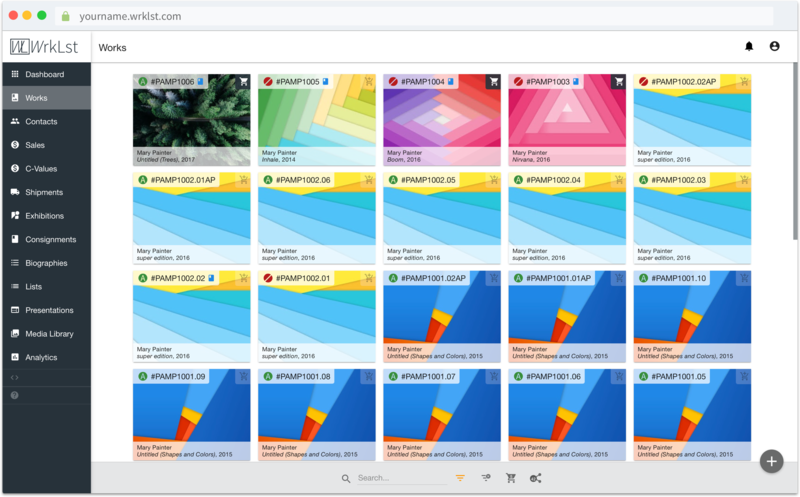 WrkLst is the premium art gallery software solution that is also used by professional artist studios, consultancies, collections as well as artwork-based publishing and exhibition projects. 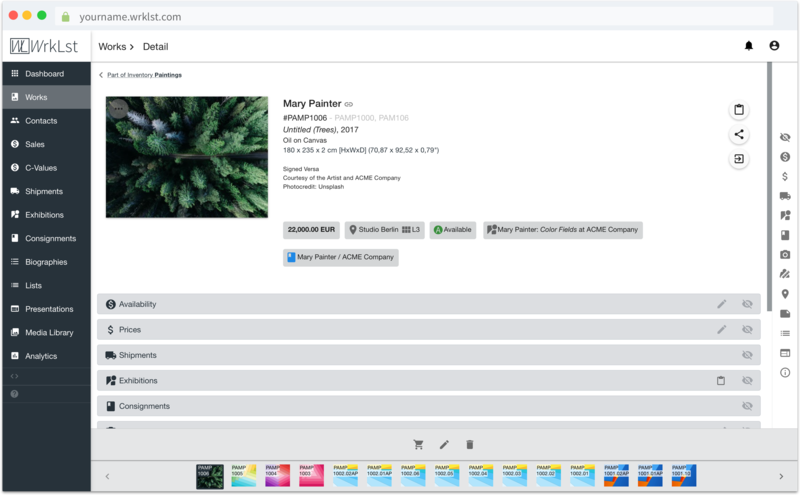 With WrkLst you keep track of artwork inventory and contacts as well as everything in between. 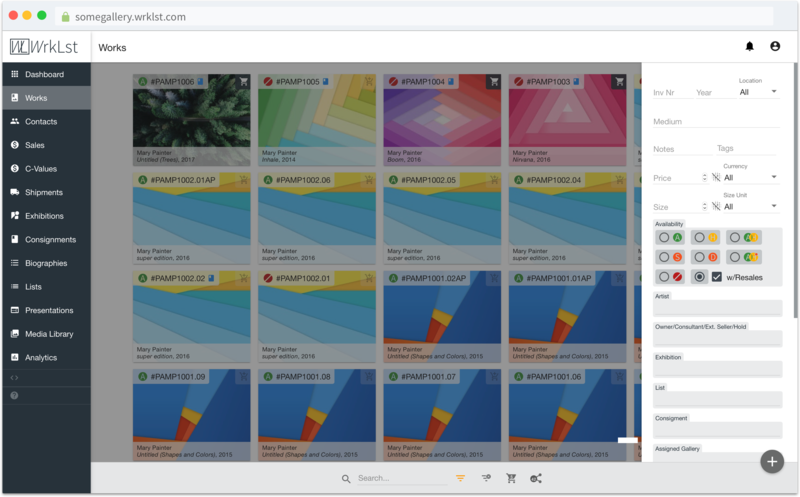 WrkLst is programmed to run efficiently, quickly, and securely on all devices with a modern web browser and an internet connection, ranging from smartphones to desktop computers. Our top priority is security – we pride ourselves on adhering to the highest industry standards in encryption technology and security architecture. Each client is provided with a personal database that strictly enforces user and role-based access policies. WrkLst is the product of over five years of prototyping in an international art gallery. It is designed by Tobias Vielmetter-Diekmann, who has a degree in Museology in addition to 15 years of experience working for art galleries and museums and a professional background in software development. A team of talented experts in the field of artwork archiving is working with us to support our client’s needs, led by art historian Laura Vielmetter-Diekmann, who has extensive experience in organizing artist studios, galleries as well as art institutions. Have easy access to your whole inventory, all neatly organized in one place. Search quickly or filter by many categories for more complex queries. See and organize all detailed information of an artwork in one place. WrkLst is currently available to a select group of internationally recognized artist studios, galleries and collections. If you would like to keep in touch and get the latest news on WrkLst, please subscribe to our newsletter. We would like to offer you a free trial! Are you interested in a free, two week trial run with WrkLst – no strings attached? Fill in your information below and we will get back to you with a introductory call to setup your free trial account. We look forward hearing form you!